Condition: Ch�beri (middle part) of gold brocade, top and bottom of beige silk. off-white and gold suji (the strip around the painting). Ivory rollers. Titled, signed and sealed wooden box. The painting is provided with a futomaki (fat roll), clamped around the bottom rod in order to increase its diameter and thus protect the pigments. 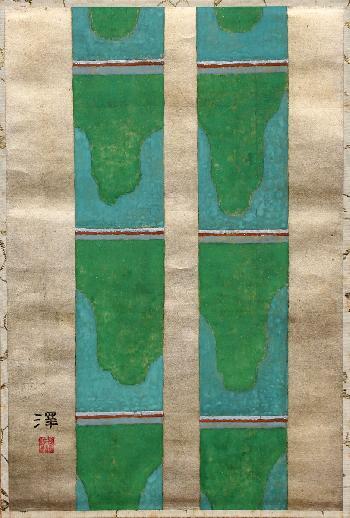 The back of the mounting of the painting is foxed, none of which is showing on the front apart from a few specks on the suji. Very good overall condition.